Known as a reliable manufacturer and supplier, we offer the best quality of P.N.P. Emitter Transistor Apparatus. For designing the offered P.N.P. common emitter transistor ch. curve apparatus in accordance with the industry set norms, we make use of latest technology. Motivated to attain maximum client approval, the quality of the offered curve apparatus is never compromised. ultiple DC Power Supply is designed as a Constant Current (CC) and Constant Voltage (CV) source for use in laboratories, industries and field testing. With compact size, light weight and required for low power loss, it provides DC output voltages for Analog and Digital testing. A 3 digit display for voltage & 3 - digit for current is provided to read the values. These two parameters are switchable for indicating either voltage or current. 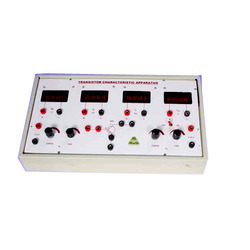 Scientech 4077 A has an excellent line and load regulation and is provided with protective circuits to ensure trouble free operation. As a noteworthy entity of this domain, we are instrumental in manufacturing and supplying the best quality of Battery Eliminator. 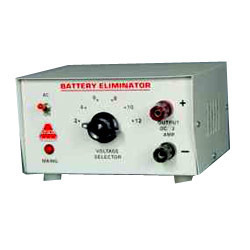 Owing to its compact design and high functionality, the offered battery eliminator is highly demanded. By using advanced technology and quality assured materials, the offered battery eliminator is precisely designed in harmony with industry laid norms. We are Maths Kits Manufacturers - We produce Comprehensive Maths kits and offer a wide range of math manipulative for the classroom and for maths teachers, these strand specific kits, problem solving kits are excellent for teaching maths topics. Looking for Digital Meter ?